Tracy McGrady appears to be unhappy with reports in Chinese media – from late-August, it seems — that his asking price to play in the Chinese Basketball Association this season was $2 million. McGrady posted the above message to his Sina Weibo account last Monday, brought to us via The Li-Ning Tower. T-Mac appears to deny that $2 million figure (though he doesn’t say so explicitly), which indeed would be a lot of money for a Chinese team to pay a 34-year-old who doesn’t play defense. He also appears to be saying that he plans on staying retired. McGrady played the 2012-13 CBA season with the Qingdao Double Star Eagles and had, by all accounts, an eventful year. He then sat on the bench of the NBA Western Conference champs, the San Antonio Spurs, as the human victory cigar. 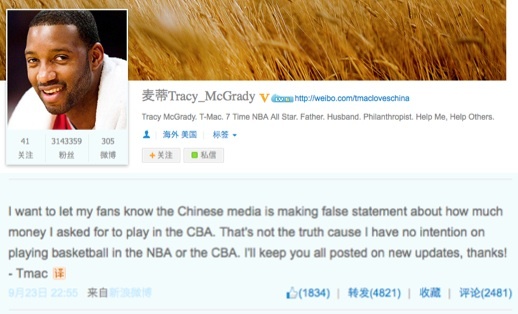 By Yang Yi, he might be referring to the Xinhua editor who wrote this piece, which reports — accurately enough — that McGrady has no interest in returning to the CBA. During his first CBA season with Tsingtao Doublestar, McGrady had some conflicts with Chinese referees. He blamed the referees on his Sina Weibo (Chinese version of Twitter) after a controversial CBA game, and he was fined and suspended for one game as a result. Yang is referring to the night when McGrady called the refs “three blind mice” on Sina Weibo after a particularly poorly refereed game. “If McGrady had false illusions that he deserved to be starting, it would be painful to watch him reduced to this role when he’s still only 34,” ESPN commentator J.A. Adande said. As members of the 1997 draft class, McGrady has become a role player while his peer Tim Duncan remains his superstar status. In any case, everyone gets upset at Chinese media now and then. Welcome to the club, T-Mac. We’ll monitor this story and let you know if the tweets get angrier. Yang Yi is basketball analyst/journalist/commentator, currently with Titan Sports, and has also been with CCTV5. The bad blood between Yang Yi and T-Mac goes back about ten years to when Yao was with the Rockets. I’ve never heard the SF/SG T-Mac compared to the C/PF Tim Duncan. Because they came into the league the same year? Weird. Sure sign of a know-nothing basketball analyst. T-Mac is going to be in the hall of fame. TD is one of the top 3 big men of all time. They’re both awesome. PS. Lesson learned, if you’re a 老外 in China, it doesn’t matter how tall, good looking, rich, or successful you are. You’ll never be good enough. Even 大山 you supplicates and prostrates to the Chinese on an hourly basis, is a laughing stock in China.